"We must remove the Decalogue [Ten Commandments] out of sight and heart." "We have no wish either to see or hear Moses." "If we allow them- the Commandments- any influence in our conscience, they become the cloak of all evil, heresies, and blasphemies"
"If Moses should attempt to intimidate you with his stupid Ten Commandments, tell him right out: chase yourself to the Jews." You'll get plenty of hits if you put any of these quotes in a search engine. What you may not find is a context. Below is a closer look at these quotes, as well as examples of their usage (or rather, mis-usage) from Roman Catholic web pages. One should never fear a context, especially with Luther. Many times, what seems so awful really isn't when you've got the entire passage in front of you. If you've come across these quotes, one of the major writings that's popularized them in cyberspace was Patrick O'Hare's The Facts About Luther (Illinois: Tan Books, 1987). This old book was reprinted in 1987 and was heavily used by Rome's cyber-defenders in the late 1990's - early 2000's. “ ‘John 14:10. Do you not believe that I am in the Father and the Father in Me? The words that I speak to you I do not speak on My own authority; but the Father who dwells in Me does His works.’ As I have said, it is the purpose of these words to impress on and drum into us this chief article. Where the relationship of man to God or the ascertainment of God’s will is involved, we are to learn to dismiss everything else from our sight and heart, whatever may be taught and preached, even in the Law of Moses, and still more everything that proceeds from human reason and imagination. We must learn this one thing: to have a clear conception of Christ and let nothing tempt us away from this or lead us astray, be it a good work or an evil one, a good life or an evil life, holiness or sin. This is the knowledge in which St. John, an outstanding evangelist with regard to this theme, and St. Paul instruct more than the others do. They join and bind Christ and the Father so firmly together that we learn to think of God as only in Christ. As soon as we hear the mention of God’s name, or of His will, His works, His grace, or His displeasure, we must not judge these as the voice of our heart or man’s wisdom may discourse on them, or as the Law may suggest to us; but we must nestle and cuddle on the lap of Christ, like dear children on their mother’s lap or in her arms, and close our eyes and ears to everything but Him and His words. Or we must see Him as the faithful Savior, who sheds His blood so richly on the cross, rises again, subdues the devil and hell, treads death underfoot, proclaims this to you both personally and through the apostles, and grants all this to you. Thus He affirms abundantly that He harbors no anger or disfavor toward you but does everything to help and comfort you, all that He should and can do, if you but believe and accept this” [LW 24:64]. Now then, let us get to the bottom of it all and say that these teachers of sin and Mosaic prophets are not to confuse us with Moses. We don’t want to see or hear Moses. How do you like that, my dear rebels? We say further, that all such Mosaic teachers deny the gospel, banish Christ, and annul the whole New Testament. I now speak as a Christian for Christians. For Moses is given to the Jewish people alone, and does not concern us Gentiles and Christians. We have our gospel and New Testament. If they can prove from them that images must be put away, we will gladly follow them. If they, however, through Moses would make us Jews, we will not endure it”[LW 40:91]. Anyone who, like the enthusiasts, erects Mosaic law as a biblical-divine requirement does injury to the preaching of Christ. Just as the Judaizers of old, who would have required circumcision as an initial requirement, so also the enthusiasts and radicals of this later era do not see that Christ is the end of the Mosaic law. For all the stipulations of that law, insofar as they go beyond the natural law, have been abolished by Christ. The Ten Commandments are binding upon all men only so far as they are implanted in everyone by nature. In this sense Luther declares that “Moses is dead [LW 35:158]. From this you should learn, therefore, to speak most contemptuously about the Law in the matter of justification, following the example of the apostle, who calls the Law “the elements of the world,” “traditions that kill,” “the power of sin,” and the like. If you permit the Law to dominate in your conscience instead of grace, then when the time comes for you to conquer sin and death in the sight of God, the Law is nothing but the dregs of all evils, heresies, and blasphemies; for all it does is to increase sin, accuse, frighten, threaten with death, and disclose God as a wrathful Judge who damns sinners [LW 26:365]. Father O’Hare is engaging in a fallacious selective citation process. Luther is here speaking with a law /gospel distinction in regards to justification. Just a paragraph later Luther says, “Apart from the matter of justification, on the other hand, we, like Paul, should think reverently of the Law. We should endow it with the highest praises and call it holy, righteous, good, spiritual, divine, etc.”[LW 26:365]. Now if anyone confronts you with Moses and his commandments, and wants to compel you to keep them, simply answer, “Go to the Jews with your Moses; I am no Jew. Do not entangle me with Moses. If I accept Moses in one respect (Paul tells the Galatians in chapter 5[:3]), then I am obligated to keep the entire law.” For not one little period in Moses pertains to us [Source: LW 35:165]. How, then, is “Moses” Word of God, and how is “Moses” law? How do Word of God and law relate to each other? Here Luther makes sometimes the most contrary statements. 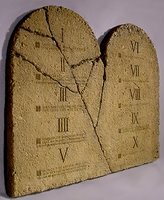 On the one hand “Moses” is completely abolished: “Moses does not pertain to us.” On the other hand we hear Luther expressing the wish “that [today’s] lords ruled according to the example of Moses.” Anyone who, like the enthusiasts, erects Mosaic law as a biblical-divine requirement does injury to the preaching of Christ. Just as the Judaizers of old, who would have required circumcision as an initial requirement, so also the enthusiasts and radicals of this later era do not see that Christ is the end of the Mosaic law. For all the stipulations of that law, insofar as they go beyond the natural law, have been abolished by Christ. The Ten Commandments are binding upon all men only so far as they are implanted in everyone by nature. In this sense Luther declares that “Moses is dead [Source: LW 35:158].